Its a fantastic example of interactive customisation, allowing the user/ wearer / co-designer to adapt the pieces to new scenarios. 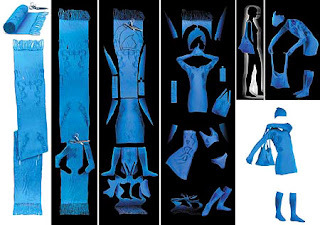 Its also a cleverly engineered concept for transformable fashion as it has been designed for assembly and disassembly. I have been thinking about clothkit/kit fashion… Is there a toolkit that will allow anybody to create their own clothing? Cloth-kits were a 70’s phenomenon of pre-printing garment patterns onto fabric, requiring the user to cut along the pre-printed lines, assemble and stitch. Then in the 90’s visionary fashion designer Issey Miyake took the concept to a whole new level when he introduced A-POC (a piece of cloth). To create A-POC an industrial weaving machine is controlled by a programmed computer, which produces continuous tubes of fabric, which form both shape and pattern, producing seamless garments requiring no needle and thread! To assemble the wearer cuts along the pre-.marked lines, to adapt shape and length and then the garment is ready to wear! This patent-pending process has been a closely guarded industry secret, which has the potential to provide design solutions at a time when we are rethinking and questioning our production and consumption. Prof Toshiko Mori, an architect at the Harvard Graduate School of Design referred to A-POC as a high tech, high design, low-cost solution. I went down to Shoreditch Town Hall last wednesday night for a talk about creativity in London. Hussein Chalayan was part of a panel of creative experts who reflected on how London has impacted their work and them as individuals. The talk was really interesting as it talked about London being a platform for creativity by attracting designers and artisans from all over the world. The second half allowed the audience to poise questions to the panel, the majority were for Chalayan and about the inspiration behind his 2007 collection. He said the collection was inspired by 111 years of fashion and reflects a political atmosphere influenced dress code. 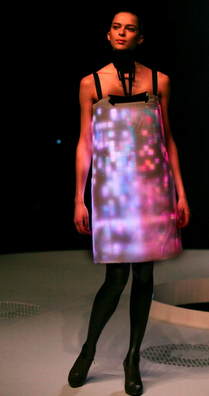 By morphing clothing together it mechanically changes the complexity and language of the clothing.